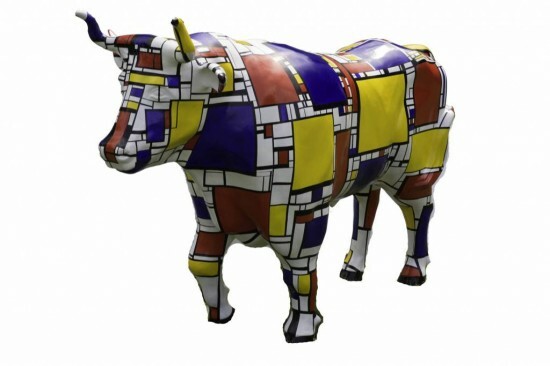 "Mooo'ndrian" was awarded Honorable Mention by our panel of Stampede Judges. Congratulations! Piet Mondrian was one of the great painters of the 20th Century. After painting for decades in his native Netherlands, he turned to America for its vibrant jazz and the neon lights of Broadway for influences and artistic inspiration. Mondrian’s vocabulary of bold lines and primary colors speaks to the language of abstraction and its timelessness in its elemental and primary components. It is instantly recognizable. His abstract grids have been popularized in haute couture fashion, as well as the signature design on private jets, costly race cars and the sedans of the rich. We have taken the abstract grid motif of Mondrian and adapted it onto the surface of one of his iconic images – the ox or bullock for all to enjoy. It reflects a sense of artistic humor, an acknowledgement of his relevance to contemporary life and a homage to the elements of art… which transcend the limitations of language, time and culture.